Wonderful, I love anything related to sewing. I have some of my Grandmother's sewing supples. They are such a treasure!! I hit stumble and got here.. Strangely enough its similar (though I'm sure, far more difficult) than my own blog that I started about a month ago. Though, most days I have 0 views I figure it'll eventually pick up. Your blog is inspiring for me.. Gotta keep with it. I just love vintage sewing supplies! 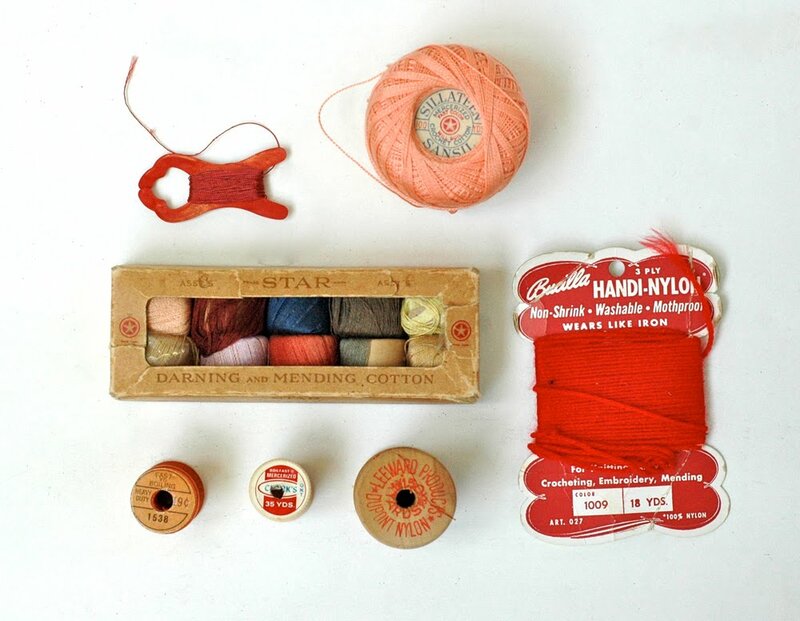 I have a small box of vintage threads and notions that I have kept. Lovely! I learned that these type of things are called "notions"; sewing notions. Like your threads give the notion of connections to other times, other hands, colors that have softened and packagings that have held up and been held over travels and usages and stowing aways. There is a story in the book Invisible Cities by Italo Calvino about a city where for all relationships, deep and superficial, a thread is strung from and to the locations of the persons in the relationships. When finally the town has become too entangled in the criss-cross of human interactions everyone packs up and leaves to make a new town - leaving only the woven web of human lives behind, leaving only the notion of the people who'd live there; people notions. gorgeous colors! i love this collection. 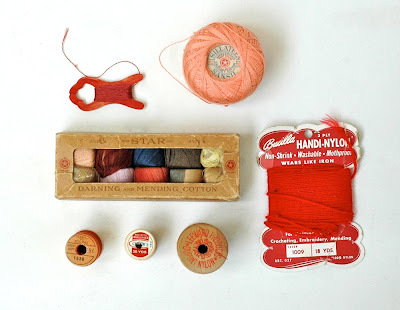 One of my favorite things to find at estate sales are spools of vintage silk thread. I have a jar of them even though I rarely use them.